They talk about me ! It is one of the most amazing temples in Egypt .it was known during ancient Egyptian time as ipt-rsyt means the souther shrine because the main god of Egypt amun-ra was worshiping in this temple and also in the northern shrine which called karnak temples . The Temple run close and parallel to the river Nile from north to south. The Luxor Temple is a temple complex located in the city of Thebes, the ancient capital of Egypt during the time of the New Kingdom. Thebes is located in Upper Egypt, on the east bank of the Nile River. Construction of the temple was begun by the pharaoh Amenhotep III and was completed by Tutankhamen. 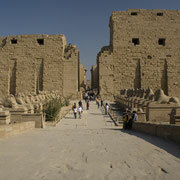 After completion, the temple complex was continually developed by other pharaohs like Ramesses II and outside conquerors like Alexander the Great. Temples during the New Kingdom were constructed as places of religious worship, dedicated to certain gods of the Egyptian pantheon. 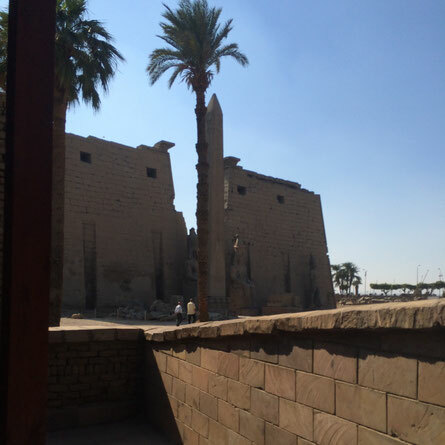 The Luxor Temple was dedicated to the king of the Egyptian gods Amon-Ra. This temple is the biggest complex temples on the world . 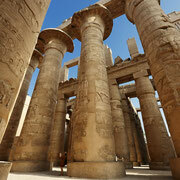 the princible building is for the main god amun-ra .it is the largest religious structure ever built . it was the gods home on earth , and around lay the homes of his relatives - his wife mut , and their sun khonsu . their temples , too are enormous . Construction on the Karnak temple complex began in the 16th century BC and continued into the Greco-Roman period - a period of up to 1300 years of construction. Around 30 successive pharoahs added their own touches to the complex : a new temple, shrine, or pylon and carved detailed hieroglyphic inscriptions.